Voussoir : The wedge shaped blocks that make up the arch and prevent each other from slipping. Crown: Voussoirs at the top of the arch. 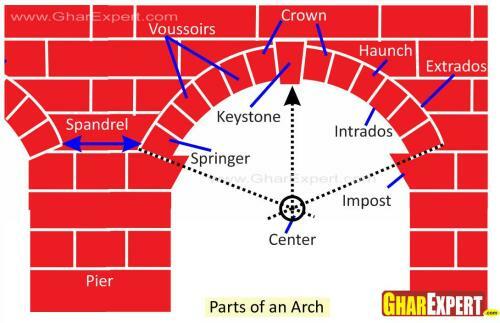 Keystone : The topmost voussior of the arch that balance the network of all voussiors. Pier :A support/ pillar on which the arch rests springer : The top stone/ voussoir that placed first on the pier to start the arch. Intrados :Interior/Inner surface of the arch. Extrados :Exterior/Outer surface of the arch. Impost :A stone which is slightly projected that surmounts the pier and the voussoirs. Haunch: Side of the arch, extends from crown towards impost. Spandrel :Wall surface bordered by the curve of the arch, the start of another wall and the horizontal part above it.